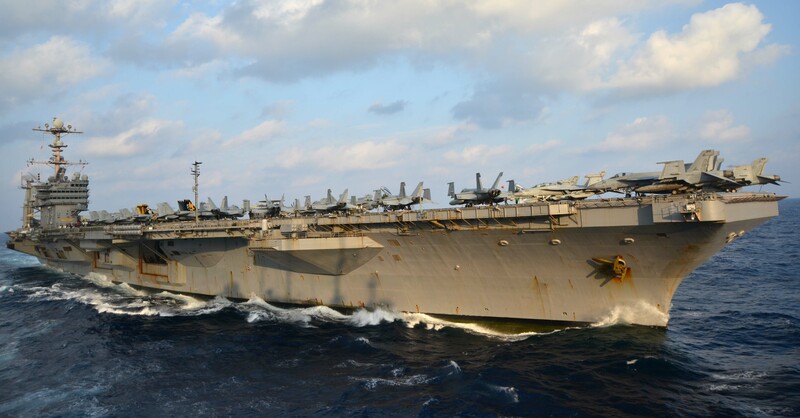 House lawmakers preserved a legislative effort to keep the USS George Washington (CVN-73) to fund the start the refueling and complex overhaul (RCOH) of the carrier as part of the Fiscal Year (FY) 2015 defense bill. House members were expected to consider legislation prohibiting the Navy and Defense Department from spending any Pentagon dollars to refuel and overhaul the George Washington. Proposed as an amendment to the Pentagon’s Fiscal Year 2015 defense spending bill, House Democrats Reps. Jared Polis (Colo.)and Earl Blumenauer (Ore.) proposed the Navy take the $483.6 million set aside for carrier refueling and overhaul to pay for the Navy’s share of the across-the-board defense budget cuts under the sequestration plan initiated by the Obama White House. However, at the last minute, lawmakers pulled the amendment for consideration in the FY 2015 defense spending package, according to a House staffer. The Pentagon’s FY 2015 fiscal blueprint, without the RCOH prohibition, was approved by the full House by a vote of 325 to 98. Polis and Blumenauer pulled the legislation over concerns there would not be enough time to fully debate the measure before lawmakers left Washington for the Memorial Day break, according to the staffer. But the staffer did note both lawmakers could reintroduce the measure when House and Senate conferees meet later this year, to hammer out the final version of the defense budget. “[They] are not ruling anything out,” the staffer told USNI News. Defense lawmakers on the Senate side are expected to unveil their version of the FY ’15 plan later this week. However, the Senate defense bill will not come to the full Senate vote until the fall. The Polis and Blumenauer bill ran contrary to a decision by House Armed Services Committee (HASC) members, who voted earlier this month to insert money into the budget to start the advanced acquisition of material for the George Washington refueling from the budgetary chopping block. The four-year RCOH process costs more than $3 billion. That total rises to $7 billion over five years to also retain a ship’s crew and aircraft from the carrier air wing. In February, Secretary of Defense Chuck Hagel announced the Pentagon would wait until the FY 2016 budget to decide if it would allow the Navy to refuel George Washington or instead decommission the ship, dropping the fleet to 10 carriers. Hagel said at the time keeping the carrier would be contingent on Congress eliminating sequestration spending limits brought about by the Budget Control Act of 2011. However top service brass and their backers in the House, most notably Rep. Randy Forbes (R-Va.) and Rep. Rob Wittman (R-Va.), vehemently pushed back against the plan, arguing the Pentagon was legally obligated to maintain an 11-carrier fleet. “This year’s defense policy bill ensures that our Navy maintains an 11 aircraft carrier Fleet, makes important investments in the future of the carrier air wing, begins modernizing Navy cruisers next year, and provides for continued procurement of Virginia-class submarines,” Forbes said in a Thursday statement provided to USNI News. Proponents of the 11-ship carrier fleet also argued eliminating George Washington would affect the White House and Pentagon’s plans to dramatically increase U.S. military presence in the waters of the Asia-Pacific region. Along with Thursday’s preservation of RCOH funding in the House defense bill, defense lawmakers in the lower chamber also overwhelmingly approved a plan to mothball 11 Ticonderoga-class (CG-47) cruisers and three Landing Dock Ships (LSDs). Forbes attempted to block the retirements in the HASC draft of the spending plan, to no avail. Forbes failed plan would have the Navy to retain a total of 22 cruisers and 12 LSDs in the fleet.